At night you fall asleep listening to the roar of lions and tigers through the canvas walls of your tent. 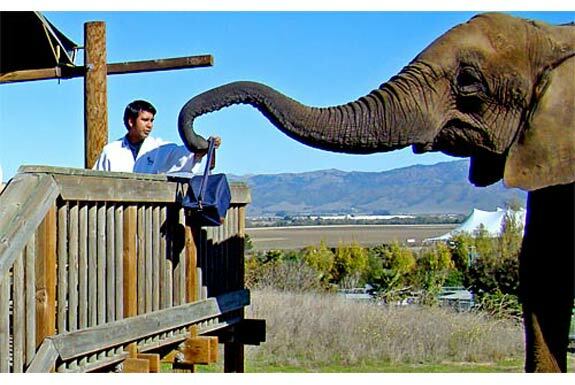 In the morning you wake up to an elephant bringing you your breakfast, carried in a picnic basket he’s holding by his trunk. It may seem like you are in Africa or in some brought-to-life children’s story. You are not. 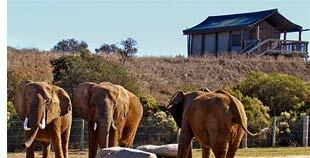 You are at the Vision Quest Ranch, an unusual B&B in Salinas, California, about an hour south of San Francisco. Like many of the world’s unusual attractions, the Vision Quest Ranch came to be through serendipity. It’s proprietor, a local police officer, agreed to take in a cougar that was being kept by a man he arrested. Then he purchased a tiger to keep the cougar company (although there was a mix up with the order and he received a lion instead—don’t you hate it when that happens?). 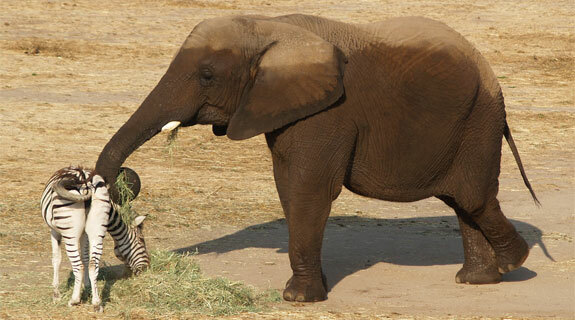 In time other animals—more than 150 of them including baboons, elephants, cockatoos, tigers, zebras—came to the ranch through various means; many were saved from less-than-humane conditions. A sort of animal sanctuary was born. 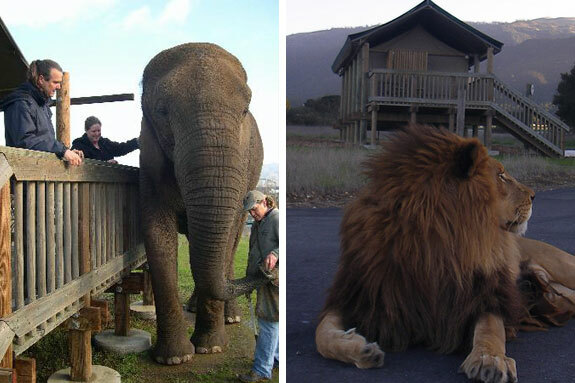 Being at the Vision Quest Ranch isn’t exactly like exploring the wilds Africa—the tigers and other dangerous animals are behind cages or fencing and all of them are fed and cared for by people. But the experience isn’t like being at the zoo either. Many of the animals roam free on the grounds and visitors are encouraged to (safely) interact with them. The mammals here are all used to humans and several once worked as stunt animals in the entertainment industry. 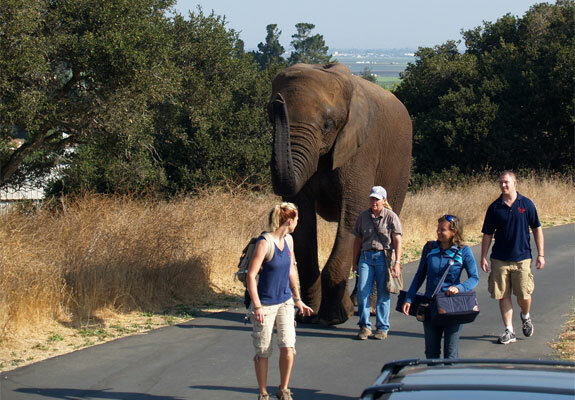 It is possible to visit the Vision Quest Ranch on one of their walking tours. But the cool way to experience this place is to stay at their bed & breakfast. 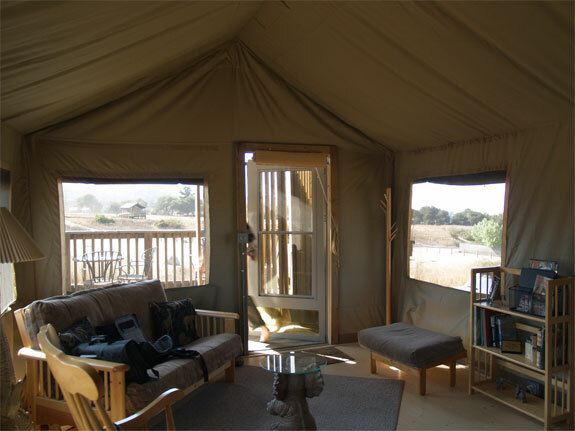 Overnight accommodations at the Vision Quest Ranch are in “African tent style bungalows.” Though, really, the only thing tent-like about them is their canvas walls and ceilings. Each bungalow (see photos, below) has proper furniture, en-suite bathrooms (yes, with indoor plumbing) and a mini fridge. 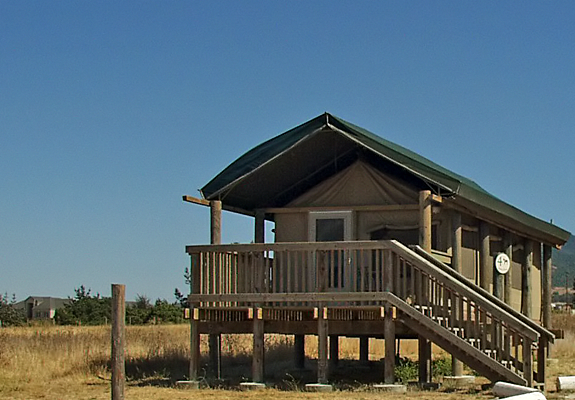 There’s no aspect of “roughing it,” unless you count the lack of a TV. 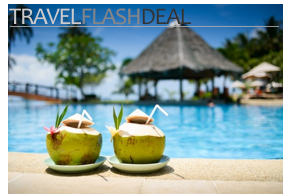 Each bungalow also as has its own private balcony where, weather permitting, you can enjoy your morning breakfast. And one of the elephants will bring you your meal! (It’s like your very own Operation Dumbo Drop.) Breakfast should consist of yogurt, croissants, muffins, fresh fruit, tea and coffee. Though if there’s a mix-up in your breakfast order good luck explaining that to your waiter. The Vision Quest Ranch seems like the perfect vacation for my daughter. I was thinking of Disney’s Animal Kingdom but this sounds nicer. How do you compare this to staying at the Animal Kingdom ? I’ve asked around and no one here has been to Animal Kingdom. So I hesitate to compare them besides pointing out the obvious difference—Animal Kingdom is a lot larger, has a lot more activities, but is also more touristy and more theme park like. Hopefully that helps a little.